SHAH ALAM: SP Setia Bhd plans to set up about 40 corporate office buildings in its 96ha integrated green commercial hub, Setia City that is worth RM5bil in gross development value when completed in 10 to 15 years. The company has secured Top Glove Corp Bhd and Khind Holdings Bhd to set up their corporate headquarters in the hub, which will comprise office towers, hotels, service apartments and a retail mall. “We are now in talks with a few local companies to set up their corporate office towers here and are not discounting the possibilities to talk to multinational companies in the future,” SP Setia president and chief executive officer Tan Sri Liew Kee Sin told a press conference after the official launch of Setia City by Housing and Local Government Ministry Minister Datuk Wira Chor Chee Heung yesterday. 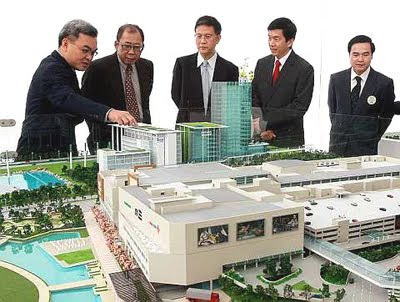 He said SP Setia was constructing its own corporate building at Setia City, a nine-storey block with a four-storey annexed building connected to the mall via a bridge. The construction of its headquarters was expected to start by the first quarter of next year and to be completed by end of 2012, he added. Meanwhile, Top Glove managing director Lee Kim Meow said the company decided to initially go for a smaller building of between six and eight floors. With the additional land area, it has the option of expanding the size of its headquarters when the need arise. On Setia City’s future development, Liew said the company planned to launch two blocks of serviced apartment and a SoHo next year, adding that it planned to build a three or four stars hotel and was in talk with a local company for a possible joint venture. “We plan to build a medical centre and a private university. We will make sure we embrace the group’s live, learn, work and play philosophy for our township development,” he said.